MELBOURNE'S Mitch Hannan is confident he can manage a persistent knee problem through this year's finals series. Hannan went into last Friday night's elimination final clash against Geelong coming off a six-day break following a starring role in the VFL where he kicked three goals for Casey to push his way back into the senior team. That performance, which included a spectacular hanger, was a reminder for selectors of Hannan's significant talent after the forward was a late withdrawal with a knee complaint from the Demons' round 23 side. "It's (the knee) been niggling for a while. So the best thing at the time was to have that week off," Hannan told AFL.com.au. "There were a few nerves about whether I would be able to find my way back into the side for the finals. "But thankfully enough it panned out the way it did. "In terms of how the body feels I was comfortable going into the game physically and I seem to have pulled up pretty well so hopefully I can continue that through the finals series." The 24-year-old returned to Melbourne's senior side for its finals-securing 17-point win over West Coast in round 22 after missing a fortnight with the same troublesome knee problem in July. 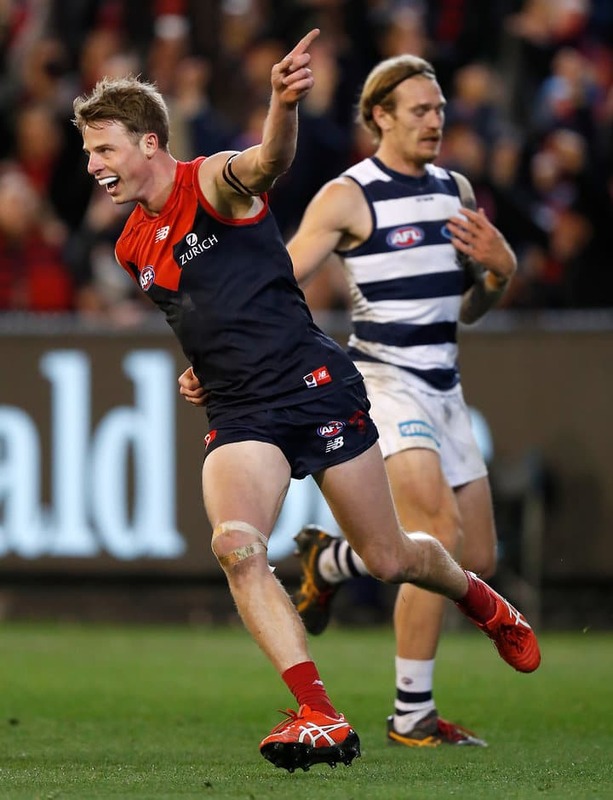 He kicked three crucial goals against the Eagles before gathering 14 disposals and booting the match-sealing goal against Geelong, when he darted away from Cat Lachie Henderson and finished on the run from an angle to extend the Demons' lead to 28 points in the final term. "I had a few ups and downs coming into this finals series but playing that (VFL) game the week before, even though the majority of the group had the week off, probably helped a lot in terms of getting match fitness," Hannan said. Hannan has become a noted high flyer, shooting to prominence with a handful of remarkable speccies before he was drafted by the Demons with pick No.46 in the 2016 NAB AFL Draft while playing for the Western Bulldogs' VFL team. Hannan's mark for Casey in the VFL qualifying final against the Cats left those in attendance in awe, with coach Jade Rawlings describing it "as the best mark I've seen this year". The @CaseyDemonsFC have won through to a #PJVFL #LovetheGame preliminary final, with Mitch Hannan bringing down this big grab today. His marking ability is a key strength of his game, but in his role as a high-half forward his work rate and speed back towards goal make him a damaging commodity. "It's just something that's natural in my game that I try to jump at the footy," Hannan said. "It's not something you got out there purposefully trying to do but if it's there I'll definitely make sure that I'm flying for my marks and something I'd love to be able to replicate at AFL level."